AND HAS BEEN PRODUCED BY A PUPPY MILL OR PUPPY FARM !! That has all their dogs Titled At BOTH ends and all 12+ OFA and DNA health testing completed !!! or the huge amount of money it takes, to completely test their dogs and have results displayed on the OFA site. Do they have an Application and wish to know about you, your family and the environment that the puppy will be living in ? Reputable breeders want to know a great deal about you before having you to their home or placing a puppy with you. without asking any information about you to find out if you would be a suitable owner. because they hope that you will fall in love with and buy the puppy once you see it. Bijou Poodles has an extensive application we require to be filled out prior to anyone visiting our home. We will provide a response after receiving an application, usually within 24 hours Mon-Thursday. Of course not everyone that has money to buy, is an appropriate owner, for one of our precious pups. above and beyond our application. We only want the best for our pups and we only want happy owners. You can also read more about how to obtain one of our pups on our Adoption Procedures web page. Where and How are the pups raised ? Breeders really differ in how they raise their pups. wire or plastic pens in the living room, kitchen, laundry room or basement. Lined with cheap, filthy, mismatched towels or blankets for pups to try to stay dry on. and if and how healthy they are. that are darkened or only done under red or yellow or even dimly lit videos and or photos. Or whose mom is a light cafe or apricot or light red as the pups will not hold colour. but there should be no strong Ammonia smell from urine and or extensive feces smell or dirty whelping areas. Whelping or puppy areas that do not have a separate area for the pups to learn to pee and poo, are not acceptable. to not endanger the health of the puppies just like you would not smoke around a baby. The area should be CLEAN with fresh absorbent material lining the bottom of the whelping area. are desensitized to a variety of stimulus and noises to develop properly. Pups should never be kept 24/7 in the family room or under a constant bombardment of noise or stimuli. Pups need quiet and to be undisturbed to physically and mentally develop properly and not be hyper or insecure. learn to move far away from their -home- to eliminate. This also assists pups to start their toilet training early on. Puppies should never be raised in wire cages/pens as not only is this uncomfortable but it doesn't teach the pups to be clean. Pups raised "wild" in the house or bedrooms also don't have learning opportunities. and sweet calm natures of our Poodle mothers ! We do have the darkest reds and browns in the world. 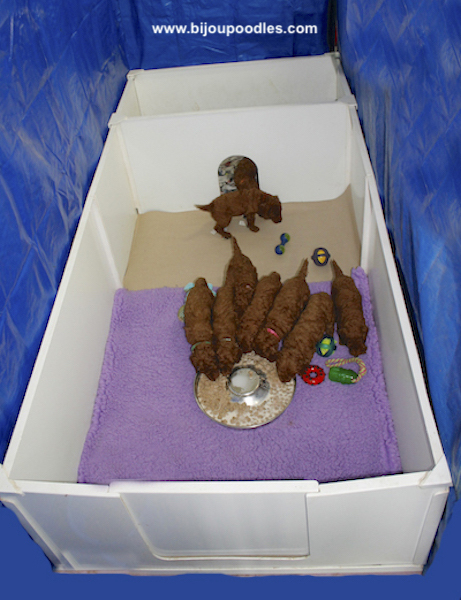 We even get video of our pups first learning to use the potty area by using the "Bijou Method" of puppy raising. When you come to pick up your puppy the first thing you will notice is that our home is smoke and smell free and clean. We believe it is paramount that pups are not exposed to carcinogens and other toxins. I'm always amazed at the number of people that come to our home and tell me that the first thing they notice is our home does not smell of pee or smoke. I really have to wonder what type of breeder's homes that they have been to previously. I would not wish to raise my precious Poodles in a home that smelt, or even looked dirty, or was over run with packs of dogs. My Poodles are my fur kids and as such are clean and well mannered and treated and raised like the family members that they are. 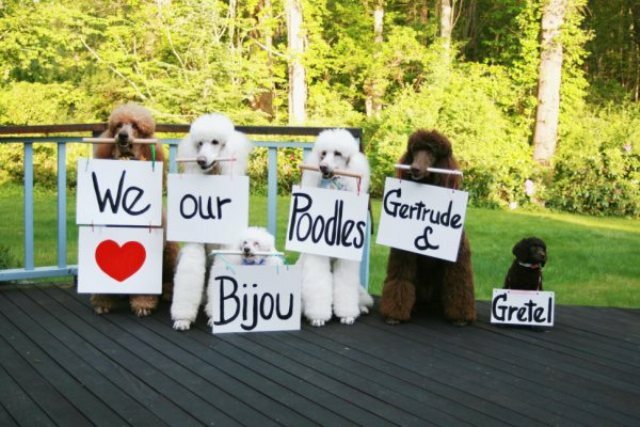 At Bijou Standard Poodles our Mom's and our pups are raised in our Home. 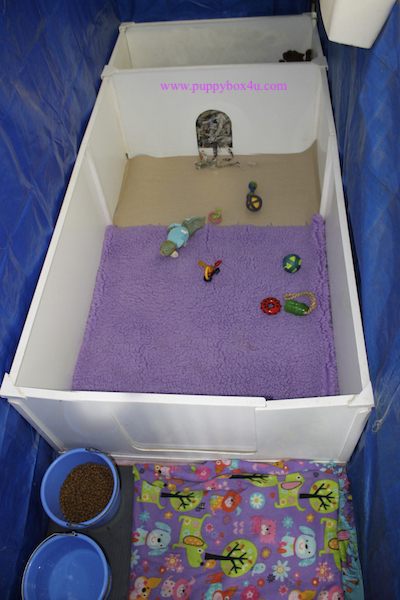 when they are moved to our specially custom designed and built Puppy Box that took us years to design. from where they eat and sleep, starting their toilet training which is called the "Bijou Method". Mom also has room to do her training and to properly care for her pups and teach them to be clean as well. but my goal in doing this, is to encourage and promote clean, healthy puppies with no bad habits and who have started their potty training. Judging from the feedback that we get, about our pups learning to be house trained in one week, tells me my efforts are worth it. Do they complete ALL conclusive health testing ? CMTP (Congenital Macrothrombocytopenia) and CERF (Canine Eye Registration Foundation ) Tested. or numbers that you can verify online on the Orthopedic Foundation for Animals (OFA) web page. only costs $300.00/dog in Canada, so very minimal cost for a breeder to invest considering the price of the puppy. or the breeders are only breeding for profit, not caring about what the health of their pups will be. CMTP (Congenital Macrothrombocytopenia), prcd-PRA and CERF (Canine Eye Registration Foundation ) Tested. Of course never take a Breeder's word for it, go to the OFA web page and search their Kennel names and see what comes up. 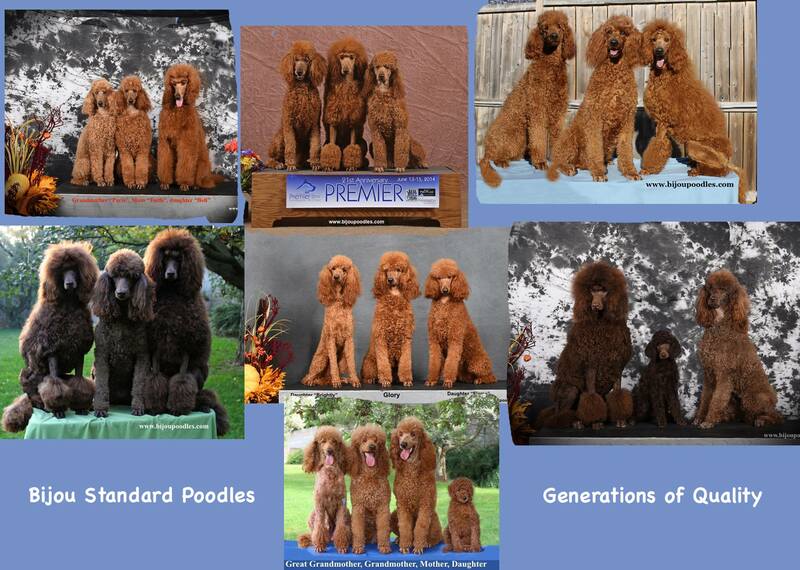 Bijou Poodles really has raised the bar for what other breeders striving to now test their Poodles for. This was not an easy process as we purchased many Poodles that failed OFA and DNA tests, which then we had to spay/neuter and find good pet homes for. 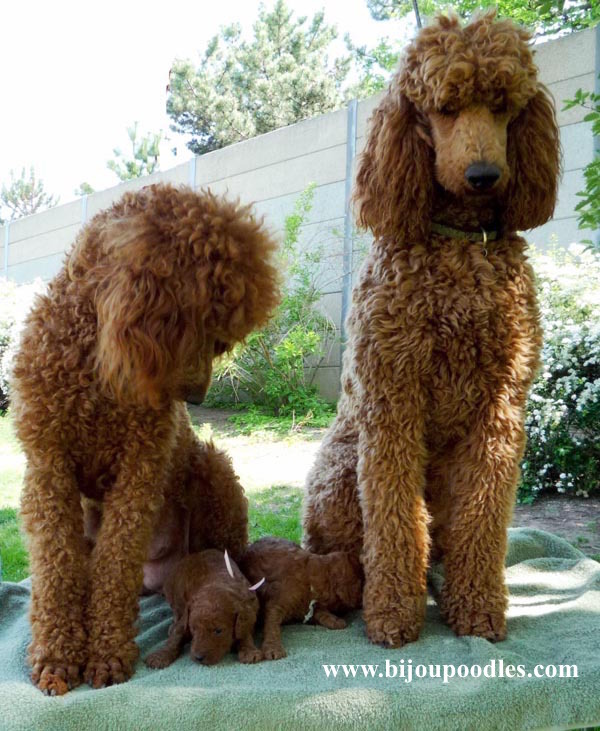 Just because Poodles look healthy does not mean they are clear of disease or genetic defect. Only health testing will prove a dog is healthy. that otherwise wouldn't care to spend the money on health testing. Genetic problems in the poodles would then soon be eradicated. Have the puppies been Vet checked ? is healthy the breeders can choose to pay for a Health Certificate to attest to this fact. 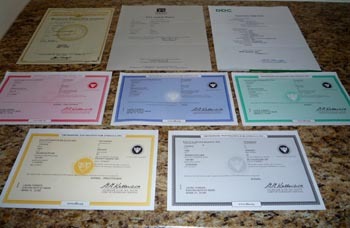 Health Certificates in the USA are good for 10 days from visiting the Veterinarian. 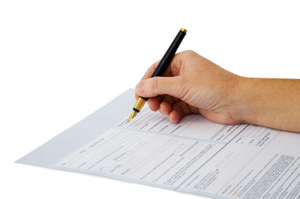 Health Certificates in Canada are only good for 30 days from visiting the Veterinarian. we do not use chemicals on our lawn or our environment. We also have a smoke free home and environment. massage therapist, T-Touch and stretching. produce puppies without health issues brought on by these many chemical and environmental exposures. We take our puppies to our Vet to be health checked at around 7 weeks of age. Do their Dogs have a Championship in ~Any~ Association ? 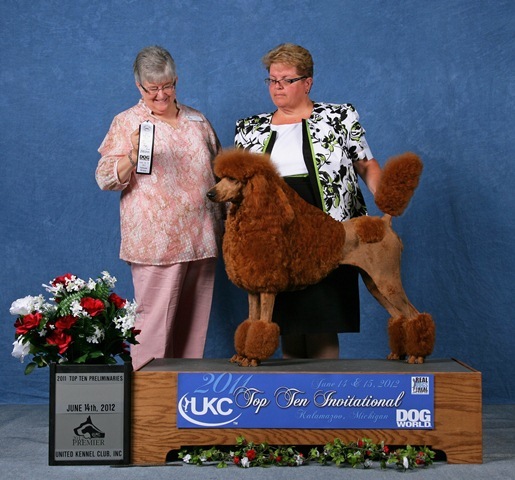 people that breed say that their Poodle has "beautiful confirmation" when the correct term known by those that do show is "conformation"
that has studied the Standard Poodle "breed standard", can truly decide how well a Poodle's conformation truly is by awarding points. 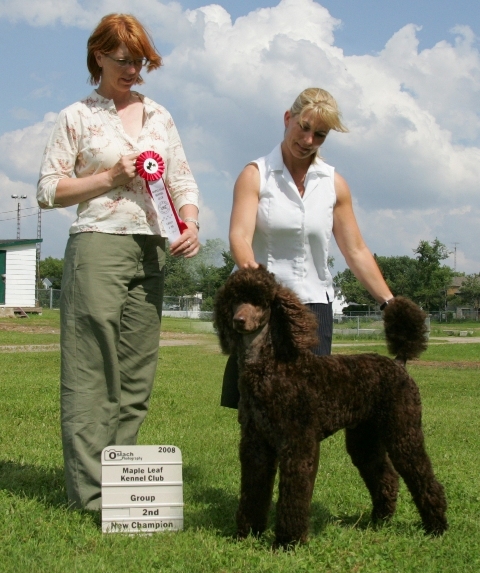 A poodle meeting the breed standard and beating competition of other show poodles will be awarded Points towards a Championship Title. 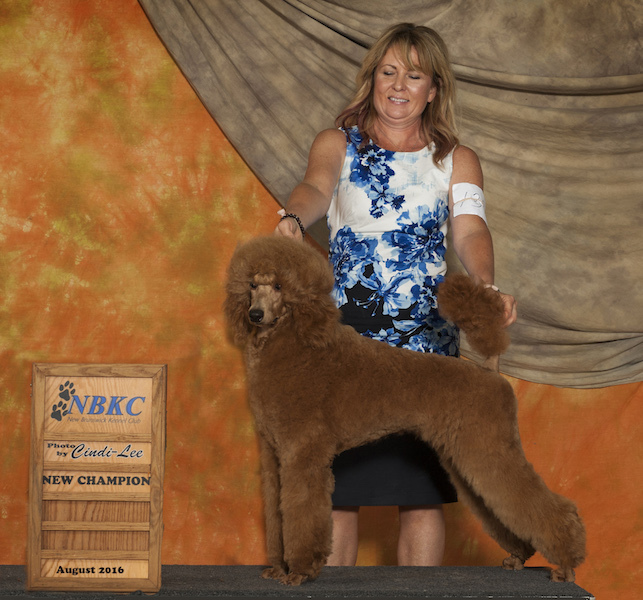 Any breeder can make claims that "everyone says my dogs are great looking", or "so and so said my poodles are amazing"
or worse, "we don't require it"
and not be shy or timid, and that the dog is physically sound, MEETING the breed Standard, without a doubt to the WORLD. with no regard to Health, Structure, Temperament. because it is a huge loss of Profit and nothing to be gained from a financial perspective. 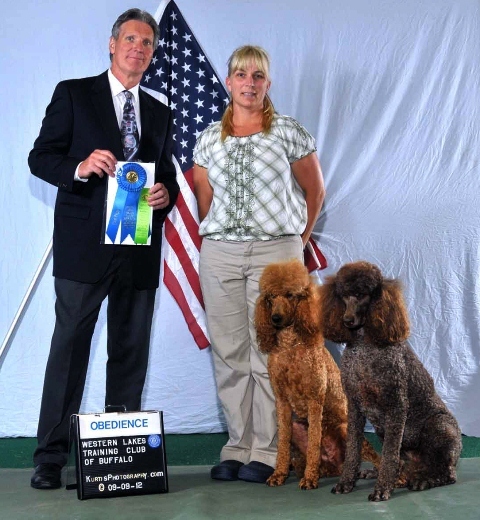 just to prove our Poodles are "ALL THAT" by earning Titles. in health, looks and Temperament in the puppy you are investing in ? 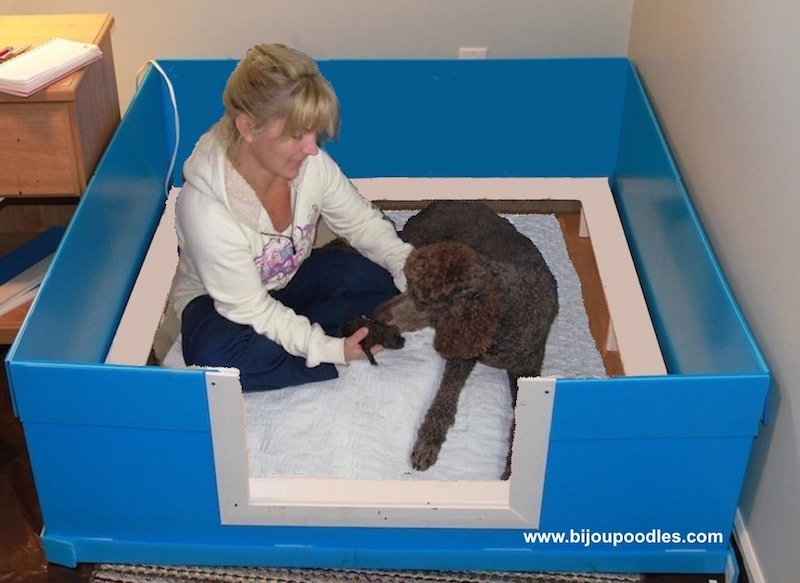 Bijou Poodles knows that a structurally sound Poodle will move well and will have less injury and health problems. Poodles with a Championship were also found to meet the poodle breed standard and as such will look like they are supposed to. 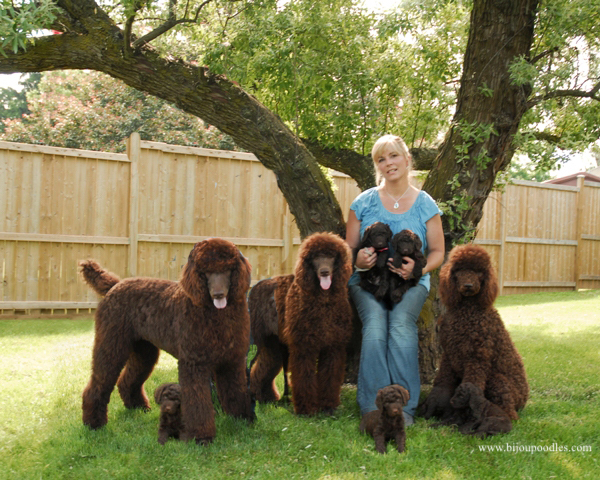 the breeder knows what they are doing and understands the Poodle Breed standard which is the blue print for the Standard Poodle. 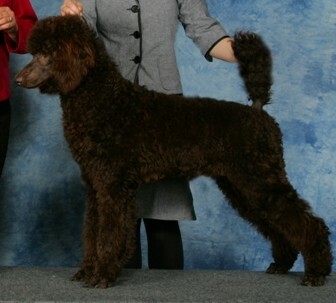 Bijou Poodles show our own Poodles in UKC and show them naturally, with very minimal grooming and no products or cheats. because the coat follows the body and shows the entire true Poodle's body structure. 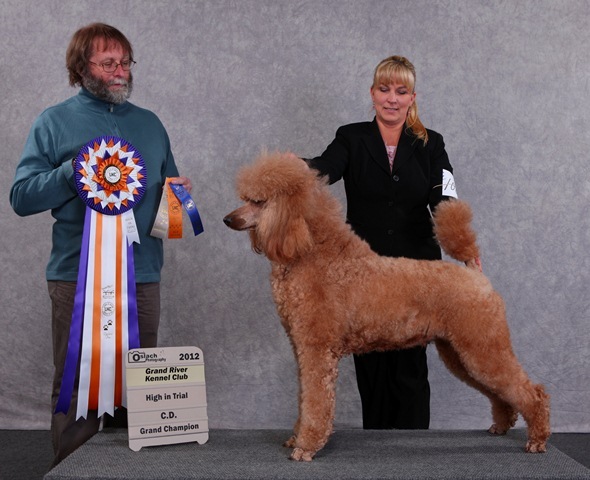 There is no hiding any faults with fancy clip, to the public observing or Judges who do go over a dog "hands on"
to evaluate Poodle Physical Structure. which they obtain with many Group wins and even Best In Show and Reserve Best in Show wins. 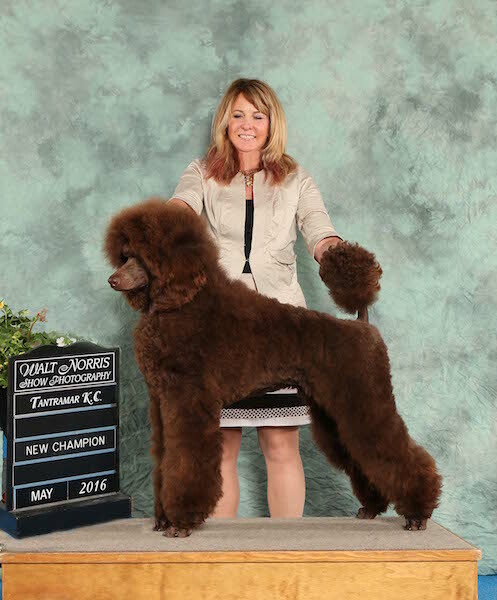 in CKC history and the first and second brown Female Grand Champion, in CKC history ! Do they compete in any Working events? Anyone can "SAY" their dog has "abilities" or "brains" or has "graduated Advanced Obedience classes from Petsmart"
that an unbiased Professional has deemed that the poodle in question has any ability to work for their owner and did well. breeding and not just to produce pups, for an already flooded puppy market. 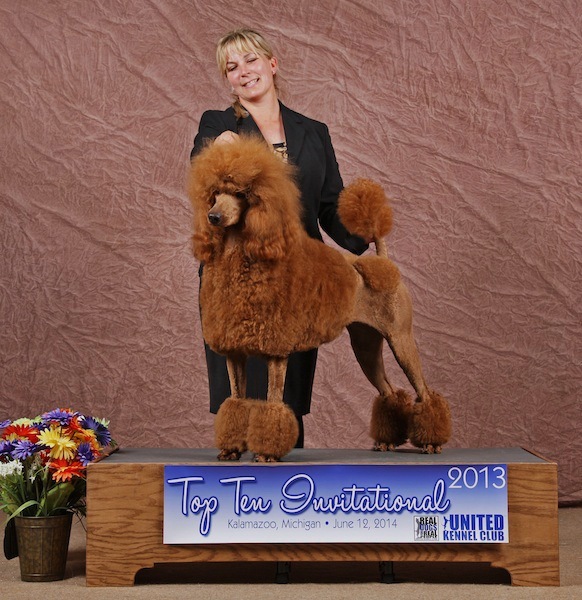 to not spend time with their poodles and proving their ability, if they are choosing to breed. Some events we list for the world to see on our Bijou Poodles Events page. and those dogs love and respect their owners enough to work for them. with no regard to Temperament, Health or Proper Structure. 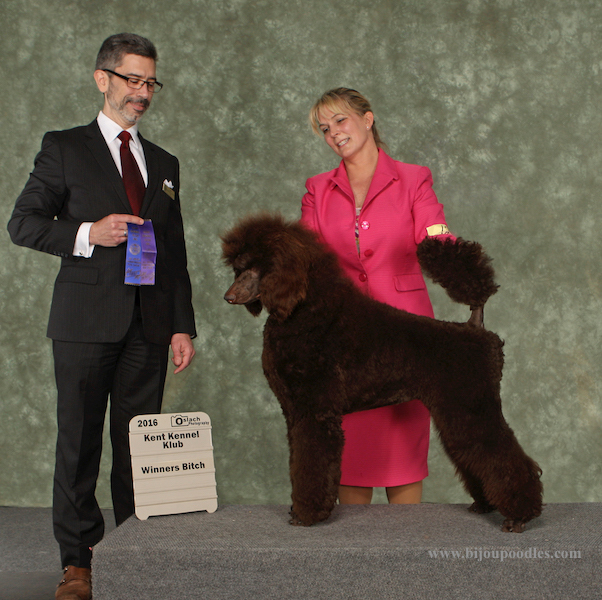 EVERY Bijou Standard Poodle has an additional Performance Title in AKC and or UKC. or keep up with our many activities our fur kids are doing, by checking on our Whats New page. Titles are the Dog World, equivalent to a University Degree. A tangible measurement of intelligence for that dog. Do they belong to any Clubs ? Clubs will only accept members who will abide by the Club's Rules of Conduct. on the latest issues such as health testing, standards, methods and tools available to improve their breeding programs. 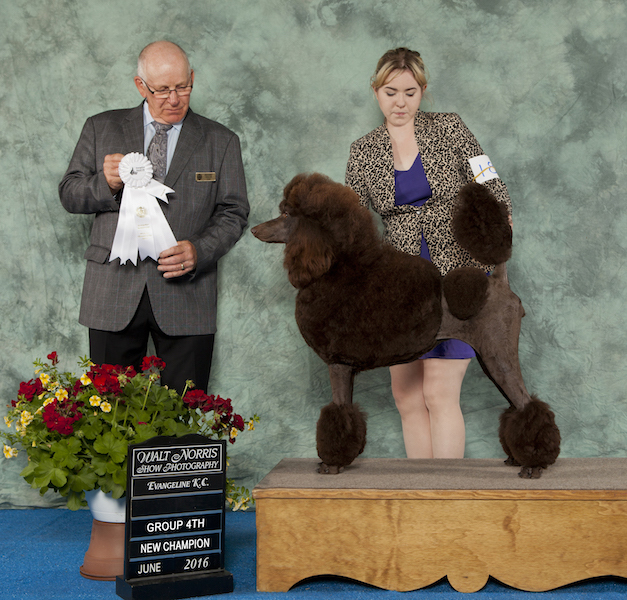 including having been published in the Canadian Kennel Club's Monthly magazine and in Poodle Variety. Why did the Breeder choose those Parents to breed together? What aspects of the pedigree that they were working with and what goal they were working towards. EVERY Poodle in the world will have Champions in the "background". So saying a breeder has "champions" in the background or a "imported" lineage "alone" are not enough redeemable qualities to do a breeding. If asked, Reputable Breeders will have more than a two line answer and for sure be willing to expound upon their reasons. Reputable breeders will also have photos of parents, grandparents, great grandparents and great great grandparents to show you. This is because they have studied pedigree and followed certain lines and have goals in their breeding programs. 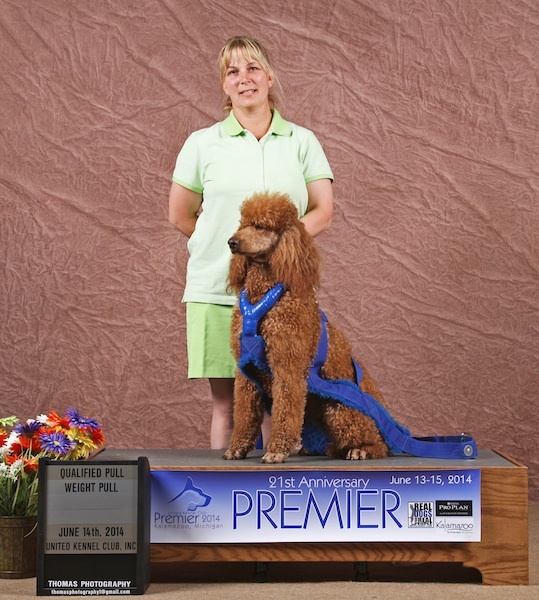 Beware of the breeder that only displays a couple old photos of their poodle parents. to achieve our successful, healthy Breeding Program. Do they have experience (at least over 10 years) in the breed "first hand" ? This is so that you know they can offer insightful advise and help you out down the road with any problems you may have. Also so that you know they will still be breeding to honor any guarantees that they offered. 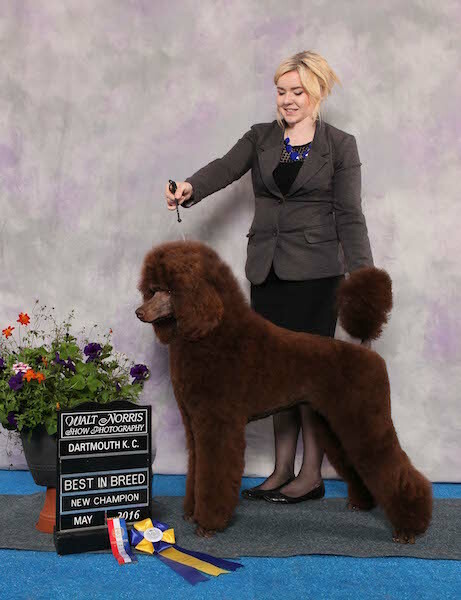 Bijou Poodles has been involved with Breeding, Training and Showing dogs since 1989.
mentoring new breeders, who I have felt showed promise to put their dogs first. Are their parents and pups Registered? that brought you to that breed in the first place. should there be any legal battle in the future and because of legally binding contracts and DNA testing, this is very possible. Registration papers means you bought a purebred. If you do not receive registration papers, then you were just ripped off and your 'breeder' is laughing at you all the way to the bank. 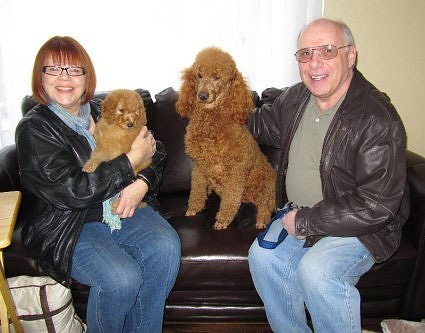 Bijou Poodles sends our "altered" pups home with their Registration Papers in their hands. and aid others in following our amazing lineage. Unaltered pups will receive their registration papers, after we receive proof of being spayed/neutered. Are their puppies Permanently Identified ? which are approved by The National Companion Animal Coalition and meet the new Canadian Standard. Registering a Microchip ID is pretty useless due to the MANY registries and is contingent upon those scanning the dog. Our pup's microchips are not registered, it is up to the new owners if they wish to do this. Never purchase from a breeder that does not have a web page. Web pages hold breeder's accountable and also is an assurance Breeders are going to be around tomorrow. Photos and video of dad growing up and current photo and video of pups, and not all under red lights or in the dark. The breeder should have properly stacked photos of the parents to show you they are of excellent conformation and healthy. Photos of pups and videos of pups should be clear and done in a variety of natural light to give you a proper idea of coat colour and health of pups. as this is done to deceive the public about the true colour of their pups which are probably cream and apricot or light brown. "real" red and true dark brown, as of 2018 is still exceptionally rare to find. judging by the parents and or previous litters the sire and dam have produced. 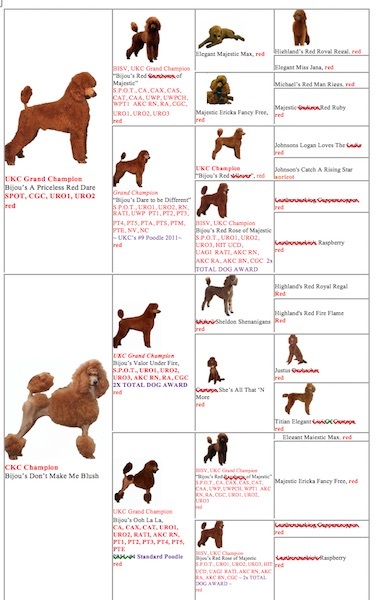 Bijou Poodles has the most extensive individual Poodle pages you will find anywhere. 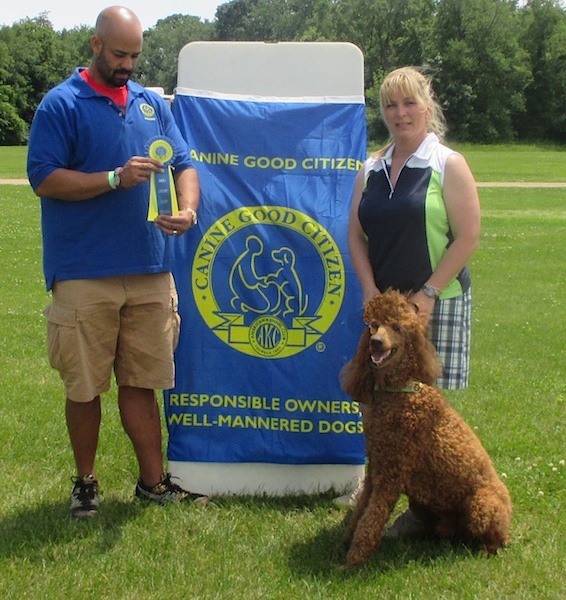 This is because we actually do activities with our Poodles and are proud to share this with the world. 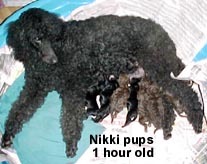 We also want to share how our Poodles develop from birth until their passing. This openly shared information helps everyone. Each of our Poodles have individual web pages, that follow their life from birth to current date and that are constantly updated. Each of our litters also has their own individual web page, that is constantly updated from conception, birth and until they go home. Our photos are clear and in natural light, (not red lamps), so that people can get a true reflection of the colour and health of the pups. 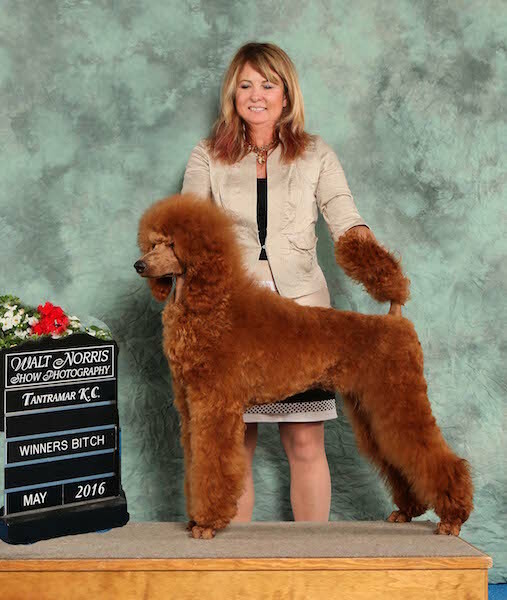 We have nothing to hide and wish to share our Poodle's beauty and accomplishments. Do they have a Photo Pedigree or UKC/AKC/CKC pedigree or COI for the pups? because they have been breeding with an eye on their history as well as the future. and be able to easily tell you what the COI is on the litter. even though they are well into retirement and being enjoyed, as loving pets. that goes home with your puppy in your puppy package. We study the history of our breed as much as we plan for the future. Do they sell with ~limited~ or on ~non-breeding~ Registration/Contracts ? because the choices you make with the puppy ~they~ bred will reflect back on their and their dogs reputation. even if it means loosing a sale because they put their pups and dogs welfare above all else. Reputable breeders may even offer to pay for Pediatric Spay or Neuter a savings for you of $300.00-$1,000.00 by their experienced Vet. sold with a Breeding Agreement Contract. 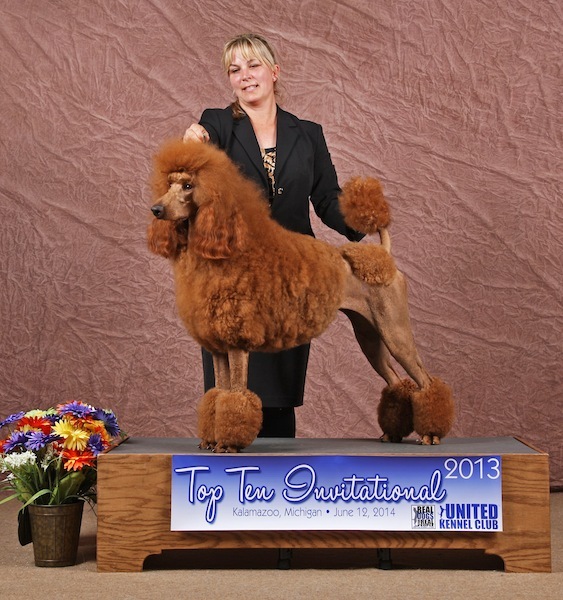 Bijou Poodles has spent a small fortune and years to achieve our breeding program. with super calm, sweet, loving natures that have made us so famous over the years. 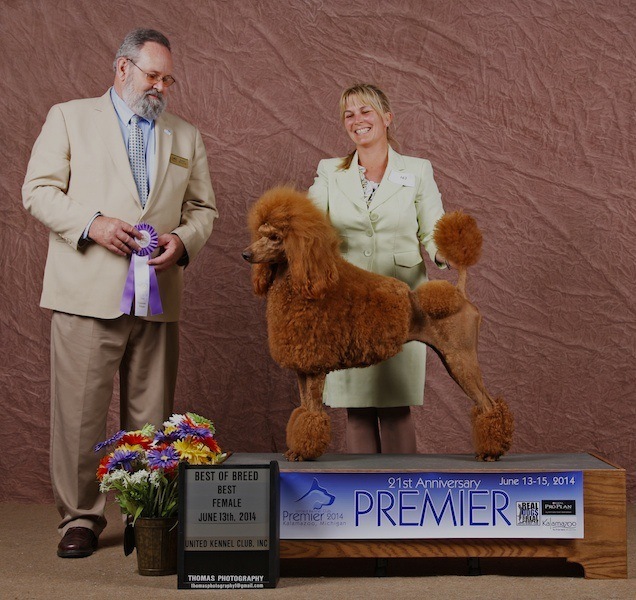 As of 2017 Bijou Poodles is the only Brown and Red standard Poodle breeders in the ENTIRE WORLD to accomplish all the above. that the public does deserve the best quality, even if the public are just looking for a pet. 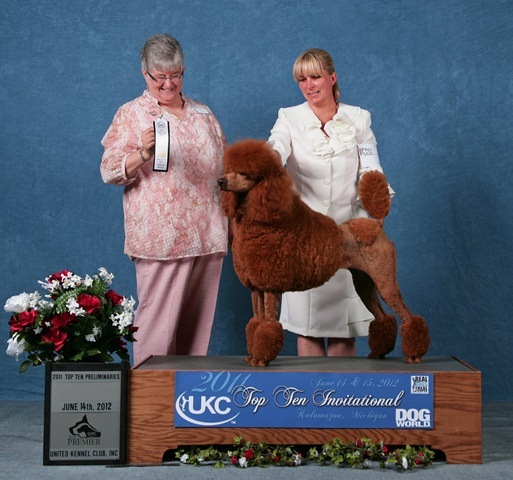 This means we have chosen to prove our Poodles are the best quality, conclusively through many venues of testing. This ongoing testing does cost us around $60,000.00-$80,000.00 a year to keep up with. we very rarely place our pups in breeding homes. This is because we do not want to see all our hard work and dedication ruined and or, our pups exploited or bred indiscriminately. We want to protect all our hard work, protect our breed, and protect the pups we carefully plan, produce and who we lovingly hand raise. than risk any of my pups falling in the wrong hands, and being exploited, bred indiscriminately or abused. and our dedication to our Poodles and to the Poodle breed. What is the Breeders Guarantee ? Most Reputable Breeders have 1-2 year health guarantee on the pups that they place. Some Breeders offer a Lifetime Guarantee but make sure to read the fine print on what that covers. congenital disorders or inherent illnesses that the Breeder has health tested for. Things like medical bills after purchase are the Buyers responsibility. All pups should come with a Health Certificate from a licensed Vet attesting to the health of your puppy. Of what is covered and what is not. that is needed and not subject them to unnecessary and harmful chemicals, toxins or treatments that are offered yearly. 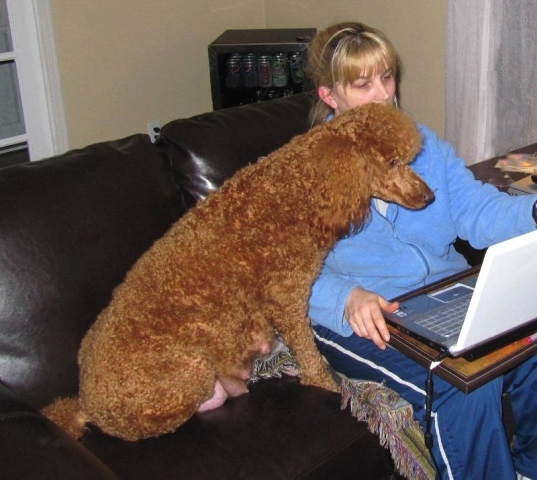 Bijou Poodles has a health guarantee that you can view online 24/7. When does the Breeder want payment? Reputable Breeders have a great deal of interest in their upcoming litters. make sure this deposit is refundable should the puppy you wished not be born. Is sent home or shipped. Bijou Poodles requires a $200.00 non-refundable deposit to secure a puppy in our upcoming litters. Balance and Shipping costs (if shipping is required) is due when pups are 4 weeks of age. Do they peddle their pups and dogs on multiple forums, message boards or free classified ads ? Ethical and Reputable Breeders are established and generally do not have to advertise on forums or classifieds. and have a list of loving homes lined up for the expected available pet puppies that will not be kept by breeder. 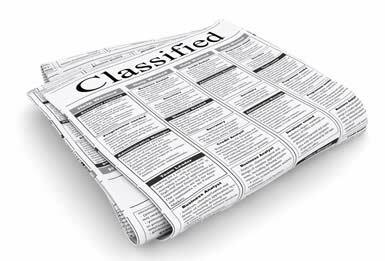 unlike forums or free classifieds where anyone can advertise under any name and then disappear with no accountability. Reputable breeders also usually place their pups based on referrals and word of mouth, not even needing to advertise. people that they believe will have their pups best interest at heart and usually will share common goals and ethics with. 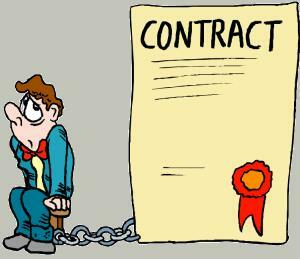 A new Breeder acting on their own, is just an accident waiting to happen and is going to have troubles. The highest compliment any breeder can receive is to have a puppy buyer come back to them for their next puppy. who that breeder was or to return to their old breeder as you know and have met what they have. 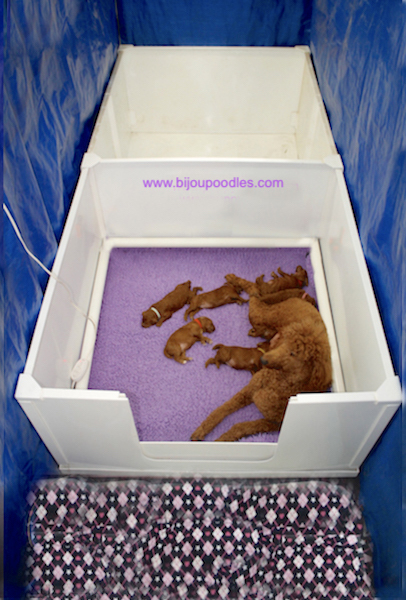 Bijou Poodles usually has our pups placed before they are even conceived. or to friends and or family members of people who have our pups and see how amazing they are. due to divorce or owners are no longer able to keep their Poodle. from past puppy people and their families. they have placed from puppy people that have kept in touch. Do they have Full Time Employment outside of their home ? Reputable breeders don't sit at home breeding and peddling pups, they have a real job and are active in doing Dog Sports. Reality is that Breeding with goals in mind and having high standards for their Breeding Program is expensive. Most Reputable breeders have full time "real" employment out side of their home, just to afford their hobby. 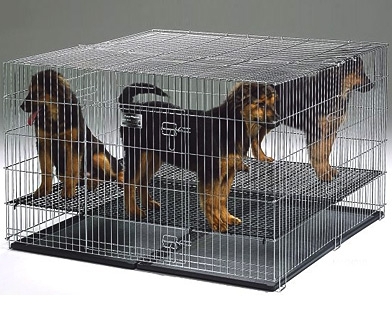 are quality worthy of being reproduced starting from the initial cost of their dogs purchase. titling their dogs with working titles and just maintaining their dogs (grooming, feeding etc), is expensive and an ongoing expense to keep up with. Most reputable breeders are rarely home as they are out taking lessons, showing, trialing with their dogs. Even raising a litter to be healthy, happy, clean, well socialized all takes up time and money. on what the breeder does with the pups, how pups are raised and what Breeder spends on their pups care. Bijou puts our Poodle's needs first and foremost. I can afford to offer only the best, because I work as a Full Time Professional Firefighter. There is no compromising on Quality of Care in "my" breeding program. My job is also 24 hour shifts, so I'm only away from my poodles for 8 days, out of a month. when I am done for the day, or even at home, when I get some 'free time'. My world revolves around my fur kids. Are the Poodles you meet in good condition ? You should see Poodles with mat free coats, that smell and look clean. Nails should be short and maintained. Poodles (without pups) should be eager to see you and or meet and greet new visitors. 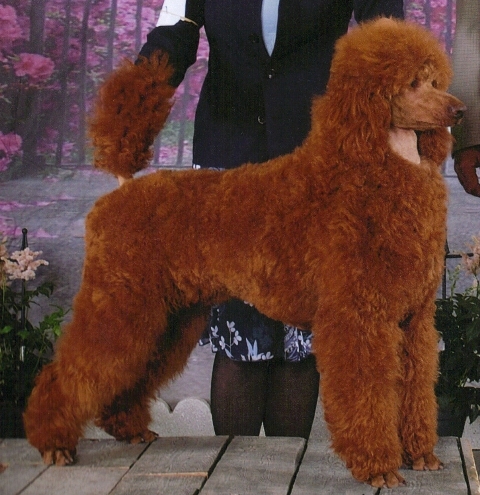 Temperaments of Standard Poodles differ with each breed and or lines. or you might meet poodles that come over and wag their tails politely sniffing you in greeting. or a calmer more reserved poodle that would do well in obedience or therapy work. come out to visit their pups, they would often never know that mom has had pups. healthy and in what great shape our Poodle parents are maintained in. sisters, puppy siblings and if at all possible even daddy. Is the Breeder available and easy to deal with ? Or even just questions in the future you want a breeder that is going to be approachable and quick to respond. you may have, even if you are ~just looking around~ usually within 24 hours. so it is best to contact them on a Tuesday or Wednesday if you wish a quick response. web page with a domain name as this is so that you know they are accountable and established. 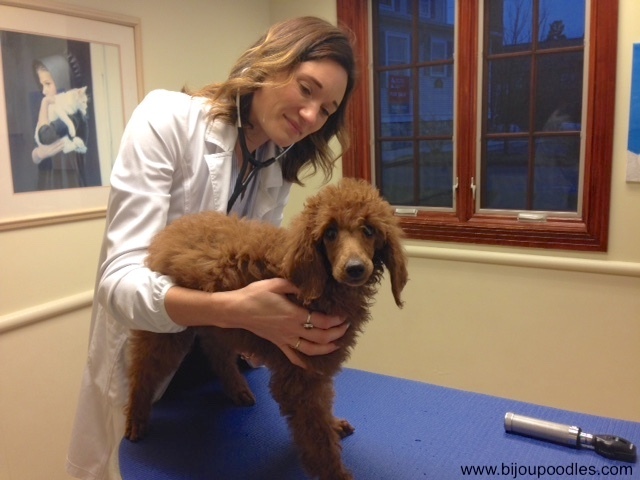 Bijou Poodles is always available to our puppy people for their puppy's lifetime. 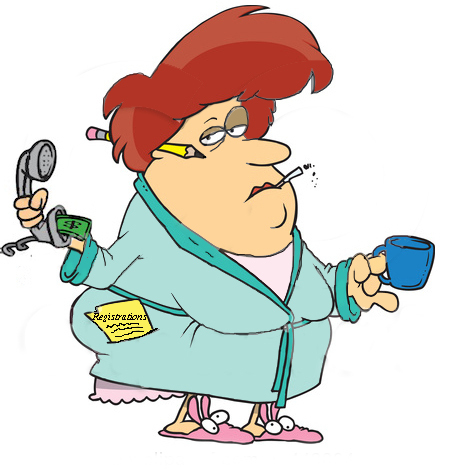 We answer all emails usually within the hour, Mon-Thursday and for sure within 24 hours Mon-Friday. continual contact and updates on how their puppy is doing. We still have people sending us their puppy updates over 15 years later ! Why is a breeder not willing to put anything in writing? What are they afraid of ? What do they wish to say and later not be accountable for ? Why do they have time to chit chat on the phone, what are they neglecting ? Training, Grooming, caring for their dogs and or puppies or even just because they actually work full time. never have any quality of time with their family and Poodles. Emails are a great way for a Puppy Buyer to keep track of which breeder said what, or which breeder had what available. This is a manipulative ploy used by BYB's when they are cornered about their bad breeding practices, to stop your questions about them. that breeder would be focusing their time on telling you all about their dog's and their dog's accomplishments. to and keep asking those questions until you get your question(s) answered. Because of the volume of interest Bijou Poodles get a day (more than 100), and because we are involved in all things "dog"
we do restrict contact to emails, so that we can respond during our down time throughout the day. This way our Poodles get the full attention from us that they deserve and we still manage some family time. Do they have a web page ? Most breeders have web pages for you to refer to. 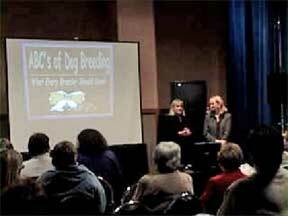 Reputable breeders will have web pages offering a ton of information about THEIR dogs and THEIR puppies. 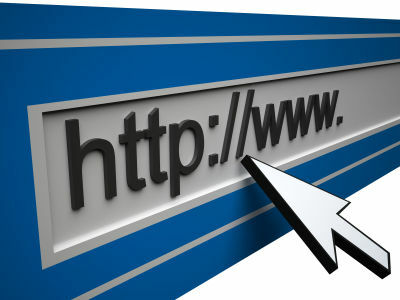 Web pages are visible for the world to see. Breeders are held accountable for the photos and information that they contain. And will also assist you in determining if they produce the type of dog that you are looking for. 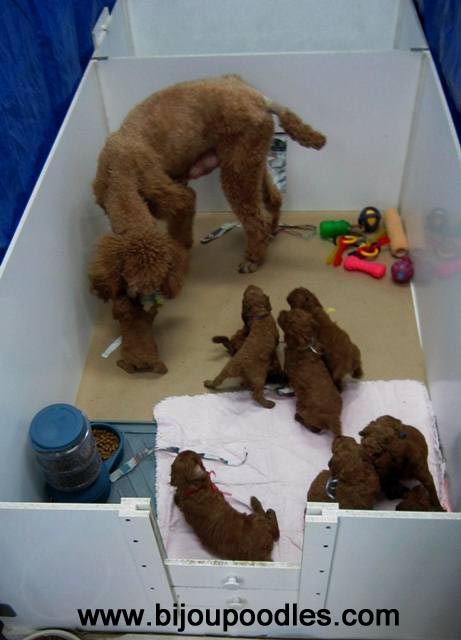 Beware of the Breeder that has a web page full of generic information and links and no photos of poodle parents. Beware of the breeder that says their priority is health and temperament, but then they don't display their Poodle's OFA clearances. They will usually just have "cut and pasted" information about OFA health testing. Ask for and verify their health clearances. not just "cut and paste" generic information or have copied my web page onto their own. to assist buyers with making an educated purchase. Bijou Poodles has our information on each of our Poodles parents available 24/7. what their employment or income is on their Puppy Application, or what type of car they drive up to the house in. that is kept up to date with photos and videos. What is the Breeder's home like ? No matter where the breeder lives you want to make sure that their home and yard is clean and smoke free. you can just imagine the condition that their dogs are raised in when you are not there to view pups. Ideally you should deal with a Breeder that owns their home. Renters can be very transient and disappear with your money over night. My home sits on a fully fenced 1 acre lot, in a well maintained, mature subdivision in the city. or just returned from a weekend away at a dog show. I also value my dog's and my family's safety. we have to be extra careful, and alert to who we invite into our home. For this reason, I prefer to get to know people, before I invite any strangers, into my private home. disease being brought into our home and there is safety at a public venue such as a dog show. Can you meet mom and dad when you pick up puppy ? but many breeders use studs that can be located a great distance away. In that case you should ask to see photos and or video of the sire. a bit protective or timid with strangers being around her babies. and appearing happy around her owners, who she should trust. Reputable breeders do not generally have people out to see very young pups due to potential exposure to deadly diseases. Some breeders might not even allow visitors before the pups have been immunized by at least one vaccination. as we know all the criminal activity that goes on in real life (hidden from the public and news casts). I have always enjoyed visitors and the opportunity to show off my family of Poodles. or in the country not exposed to city noises, or people. Plus I just LOVE showing off my beautiful, loving Poodle Family. There is nothing sweeter than going to see a litter of fuzzy playful, cuddly puppies. Unfortunately, because of the Parvo Virus, and the Super Bug, that could mean a death sentence to these wonderful innocent pups. I just cannot accept visitors to see my puppies until they are being picked up and your responsibility. of having an unsuspecting visitor bring in the virus while seeing the puppies. who may present them with awards, rosettes, ribbons, placements and ultimately titles if they qualify or are of quality enough. Of course my Poodles just think they are having fun showing off doing their "tricks" for the crowds that gather to cheer them ! and out of the comforts of their home, which will show people their true nature and temperament. my priority for my time, is caring for and spending quality time with my Poodles and my family. and what I have to offer them, out of such amazing Poodle parents. 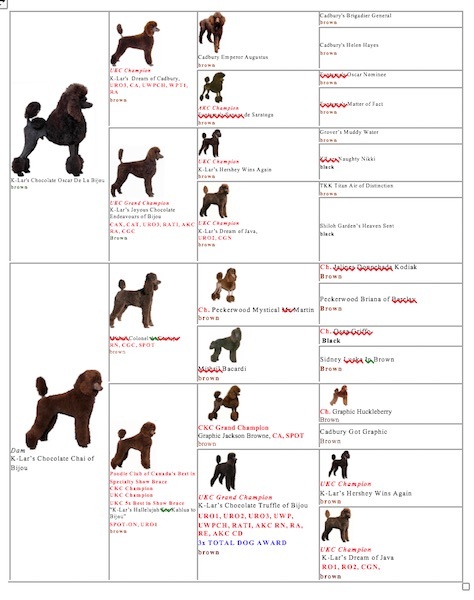 Meanwhile, I have detailed individual web pages for each and every Poodle I have ever owned. Pages that are continually updated with videos and current photos. Each of my Poodle web pages starting at the bottom, chronicle their development from birth to current day. Yes, I am that proud of each of my Poodles. I also know when buying long distance, people appreciate being able to get to meet and get to know their puppy parents and relatives. 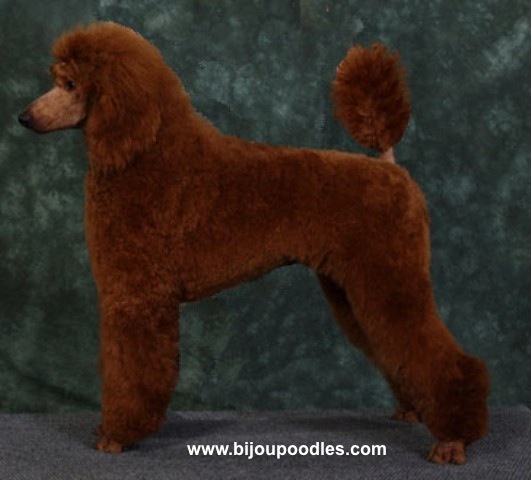 My web page is also very detailed on what makes Bijou Poodles a cut above the rest. I also offer an abundance of information contained on our Links Page. or we can ship your puppy to you, see our Procedures for more information on deposits, allocation and shipping. you are going to bring home and we try to help fulfill this wish with lots and lots of pictures. You will receive pictures and or videos at least every week and sometimes even more. We love to take pictures and or videos from conception until the week the pups go home. We start taking pictures of the puppies at rest and play so you can get an idea of their personality. so that you can get an idea of what the pups are like conformation wise as well. Our photos are taken with good lighting and with quality cameras. you will already have a bond with your puppy by the time he or she is in your arms! inquiries a day, from people all over the world wishing to visit, or to speak on the phone. work full time as Professional Firefighters and have any quality of life, if we were to entertain all of these inquires by a visit or a phone conversation. 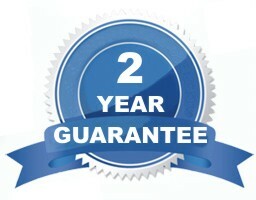 so that I can answer your inquiry when I have the time, to fully address your questions.